In the first pAsuram – parAnguSa nAyaki says “while this dangerous night is going on, emperumAn who is the protector when one is in danger, has not arrived. Now, who will be my protector?”. In the first pAsuram, parAnguSa nAyaki says “This night is stretching to have the whole universe to be dark, sarvESvaran who is the protector of all, now who will protect this AthmA?”. First pAsuram. parAnguSa nAyaki says “emperumAn who helped during the danger of total deluge, has not helped me during the deluge of separation; now, can I survive?” and gives up attachment in her living. The whole town is asleep; the whole world is filled with abundant darkness; the water bodies are all quiet, without any tides; there is just night with no difference between day and night, where the night is extended and stretched so that there appears no end to it; emperumAn who kept the whole earth which was in danger due to praLaya, in his stomach and protected it, who is having thiruvanthAzhwAn, his servitor as his bed and protecting him, who is the refuge for us have not arrived and protected us; alas! now, when the protector has not helped, who is the protector for this AthmA, that is, I who am a sinner who have very strong sins? Will the people of the town who are sleeping help me? Will the world which is consumed by the darkness help me? Will the insentient water help me? Or will the tormenting and never-ending night help me? ellE implies “ennE”, crying out in suffering. Ur ellAm thunji – We were hoping to engage in madal having the accusations of the people of the town as the support; now whose accusations will we have as support to engage in madal? It is not just some people are sleeping and others are awake – everyone is fast asleep. When thiruvadi (hanuman) visited lankA, all the rAkshasis (demoniac women) were all sleeping there, similarly, all those who hurl accusations were sleeping. Alternative explanation – since it is her birth place, seeing her plight, everyone became sad and were all sleeping in sadness like wild grass had fallen down. When brahmAsthram attacked and made everyone lose consciousness in SrI rAma’s army, at least there were SrI jAmbavAn, sugrIva mahArAja, thiruvadi (hanuman) who were unharmed and awake; here, even such few people are not awake. Thus, those who hurl accusations (people of the town), those who give advice (mothers) and those good companions (friends) were all sleeping. By this, it is explained that – since everyone is sleeping including those who torment by hurling accusations, parAnguSa nAyaki‘s state of not being able to share her thoughts with anyone and spend her time. ulagellAm naLLiruLAy – As during praLayam (total deluge), the whole world was just dark. naL – middle, abundance. That is midnight darkness, and abundant darkness. Alternative explanation – when everything becomes quiet, the night has an unique sound, “naL iruL” may indicate such state of the night too. Thus, it is explained that there is nothing which is visible to the eyes. nIr ellAm thERi – As all the living beings in the water stay deep in sleeping state, the noise became subdued there too. By saying “UrellAm thunji” – it is explained that she does not engage in conversation with some people [no use of vAk (sensory organ of speech)). By saying “ulagellAm” – it is explained that she does not have anything [worthy] for her vision and does not spend her time seeing anything [worldly]. nIrellAm thERi implies that there is nothing worthy available for her hearing to start with. This is a sample for all her senses – that there is nothing worthy in this world for the consumption of her senses. Since the senses would be active in the morning in their own activities, the anguish is less; but in the night, as they are fully focussed on emperumAn who is separated from her, the anguish is unbearable. Or nILiravAy nINdadhAl – Even previously, there were times when the night was felt very long, yet day and night will occur in a cycle; now it feels like unending night. nINdadhAl – The nights of dhEvas (celestial beings) are longer than the nights of manushyas (humans) – yet, even those dhEvas’ nights have an end; here it is endless. 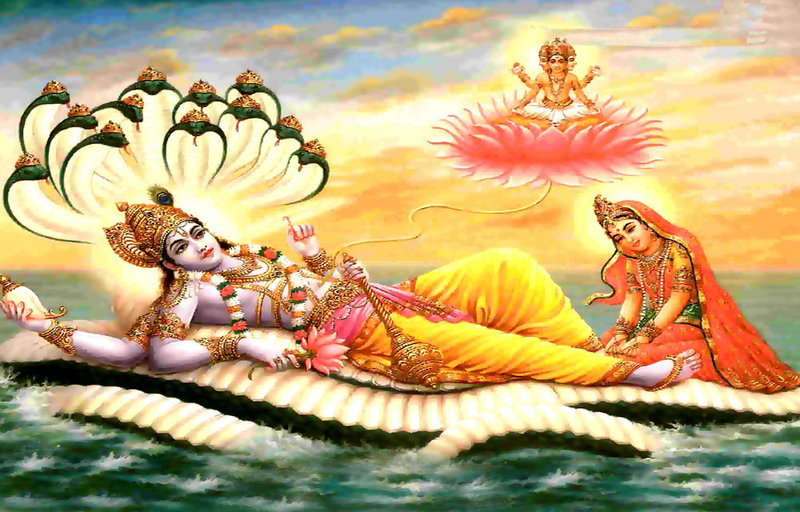 pAr ellAm uNda – During the great danger of total deluge, he protected everyone without any discrimination. It appears the collective danger faced by everyone during total deluge, is singularly faced by parAnguSa nAyaki. During deluge too, During deluge, does emperumAn only help those who set out to engage in madal and give up being unable to do so? No, he helps anyone who cannot protect themselves. nam pAmbaNaiyAn – One who gives his body to those who consider him very dear. One who is having thiruvananthAzhwAn (Adhi SEshan) as his bed. parAnguSa nAyaki says we are neither like asprushta samsAragandhar (one who is not touched by samsAram – the nithyasUris) nor like samsAris (worldly people). He lets the nithyasUris enjoy him eternally; he protects the samsAris when they are in danger though they don’t request for help, due to his [natural] relationship with everyone. nam – She is saying “nam” (Our – with proximity), since he first united, and gave her what was required to call him. vArAnAl – You need not protect me by keeping me in your stomach, you need not embrace me, just come and show your face to me. SrI rAmAyaNam ayOdhyA kANdam 83.9 “dhrushta Evahi naSSOkamapanEshyathirAghava: – thamassarvasyalOkasya samudhyannivabhAskara:” (Just like the rising sun will dispel the darkness of the world, SrI rAma will dispel our sorrows as soon as we see him). Avi kAppAr Ar – Shall I who is in danger like being caught in deluge, rescue myself? Should my friend who suffer for my result even before me, as said in thiruvAimozhi 9.9.5 “emmin mun avanukku mAyvarAlO“, rescue me? Should the mother who give good advice protect me? Or should the people of the town who hurl accusations protect me? ellE – Saying “alas!” out of amazement, or it can be said as parAnguSa nAyaki calling out her friend. Though parAnguSa nAyaki says subsequently “annaiyarum thOzhiyarum” (mothers and friends) highlighting that the friends too will be sleeping, considering the dangerous situation she is in, she thinks that her friend will be awake and hence calling her out. val vinaiyEn – I have committed great sin that even emperumAn who is sarvarakshaka (protector of all) and who does not separate from those who embrace him, is not coming and helping me. val vianaiyEn Avi – My self which is destined to live for 100 years even while being separated; she is thinking “is this AthmA which is not becoming weakened even after being separated, going to finish?”. The protector has not arrived, my friend is more anguished than me, now, are those harmful ones (the ones who hurl accusations), the protectors? This entry was posted in thiruvAimozhi, thiruvAimozhi 5th centum on June 26, 2017 by Sarathy Thothathri.